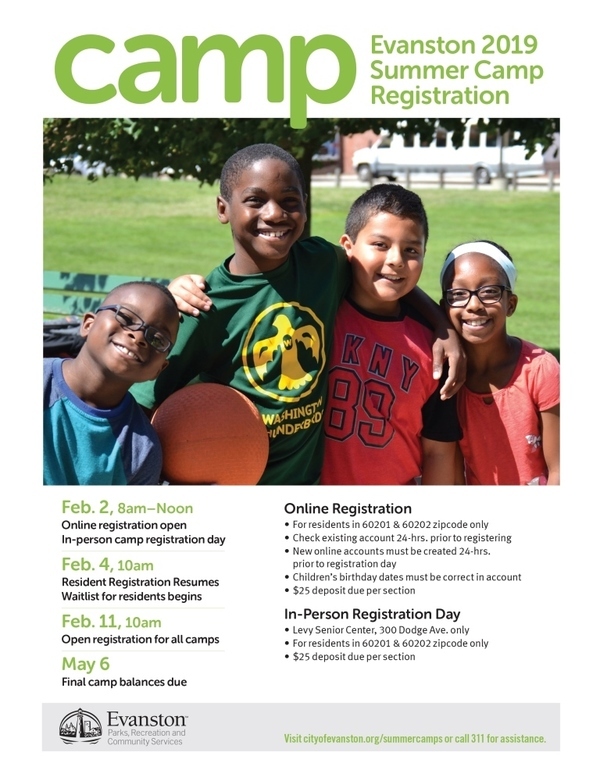 2019 Summer Camp Registration Day is this Saturday, February 2, from 8 a.m. to noon. In order to be ready to register your child, existing online accounts must be checked by 8 a.m. on Friday, February 1 to ensure you can access the website on registration day. New online accounts must also be created by then. Registration will also be available in person at the Levy Center only. No phone registrations will be taken on this date. For more information or to browse summer camp options, visit cityofevanston.org/summercamps. For questions, please call or text 847-448-4311, or simply dial 3-1-1 in Evanston. All Parks, Recreation and Community Services classes and programs on Wednesday, January 30 have been canceled. The Fleetwood-Jourdain Community Center will close at 6 p.m. on Tuesday and will be open on Wednesday from 8 a.m. to 6 p.m. for drop-in activities for children ages 5 to 14. Regular programming and activities have been canceled. The Levy Senior Center will close at 6 p.m. on Tuesday and will be open on Wednesday from 8 a.m. to 6 p.m. for drop-in activities for seniors and children ages 5 to 14. Regular programming and activities have been canceled. The Chandler-Newberger Center, Evanston Ecology Center, Gibbs-Morrison Cultural Center, Noyes Cultural Art Center and Robert Crown Center will close no later than 6 p.m. on Tuesday and will be closed all day on Wednesday.